In light of recent news reports concerning a Tulsa, Okla.-based oral surgeon, the American Dental Association (ADA) understands that there may be heightened interest in infection control procedures. Regulations for dental office inspections are determined on a state by state basis by the state dental board. Before you enter the examining room, all surfaces, such as the dental chair, dental light, instrument tray, drawer handles and counter-tops have been cleaned and decontaminated. Some offices may cover this equipment with protective covers, which are replaced after each patient. Non-disposable items like the dental instruments are cleaned and sterilized between patients. Disposable items like needles or gauze are placed in special bags or containers for monitored, proper disposal. Infection control precautions also require all dental staff involved in patient care to use appropriate protective garb such as gloves, masks, gowns and eye-wear. 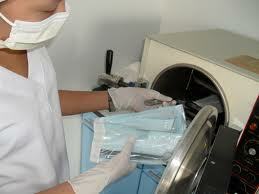 After each patient, disposable wear like the gloves and masks are discarded. Before seeing the next patient, the members of the treatment team scrub their hands and put on a new pair of gloves. Please be assured that we look at these guidelines as a minimum standard for our practice.We hold your safety and well being as paramount to how we work. We would welcome our patients to walk through with us on the various procedures we utilize in our practice. 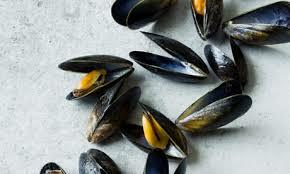 Mussels Can Help With Certain Tooth Pain. Some tooth pain develops when the hard outer enamel wears away and exposes the softer underlying dentin, which is sensitive to stimuli such as hot and cold. Pain-fighting toothpastes and chewing gums contain minerals that can augment enamel but don't adhere long enough to permanently rebuild it. For a solution, Chinese scientists turned to mussels, which secrete an adhesive to attach to underwater rocks, and they created a substance with similar sticky properties. When scientists coated worn-out teeth with the mussel-like adhesive and then soaked them in a bath of minerals, the teeth rebuilt a protective layer that simulates enamel. This discovery lead to better products for sensitive teeth. Losing Weight Can Help with TMJD. 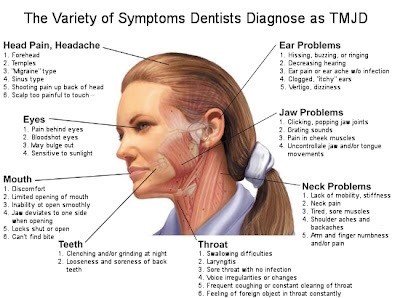 * Chronic TMJD does not correlate w/ low socioeconomic status. This finding is in stark contrast to trends seen in other chronic pain conditions. 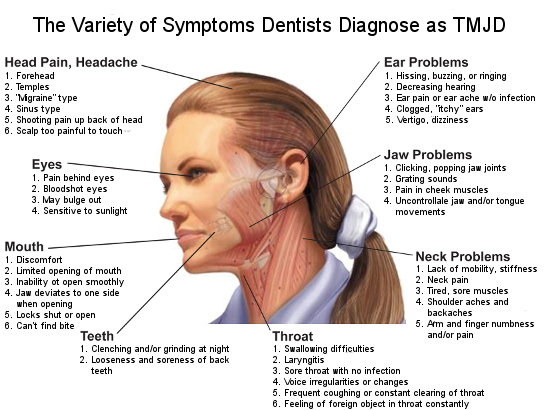 * Chronic TMJD seems to be associated w/ alterations in some parts of the nervous system that control pain perception. * Genetic variability contributes to chronic TMJD. This includes several genes known to influence stress response, psychological well being and inflammation. TMJD patients frequently experienced many more chronic pain conditions, such as lower back pain, headaches, and fibromyalgia. Evidence of abnormal jaw function associated with teeth grinding and clenching was also observed. Losing weight improves the diabetic status and helps in the response to periodontal therapy. One theory is that excessive fat cells secrete more cytokines, which make insulin less functional and lead to hyperglycemia. Losing weight improves the diabetic status and helps in the response to periodontal therapy. A second theory pertains to leptin hormone, which regulates appetite. Leptin is involved in regulating metabolism and has been associated with C-reactive protein. Tooth brushing is the major behavior performed by patients to fulfill their needs to feel clean and fresh and to avoid dental problems. It is also considered by the dentist-dental hygienist team to be the major tool in the removal and control of dental biofilm and the prevention of periodontal diseases and dental caries. Effective brushing is important but so is the design and selection of the brush. Not all brushes are the same. By using the appropriate brush and technique together, patients can maximize their daily oral hygiene efforts. Why must plaque be removed? When the plaque matures, the microbial ecology changes and becomes pathogenic due to the different microorganisms, their by-products, and in the case of gum disease, the inflammatory response provoked by the host. *the interproximal areas-in between the teeth, which are hard to reach. Plaque must be removed from the the gum line, pits and grooves in the teeth and the interproximal areas. Understanding the different elements of toothbrush design will help with making the correct selection. The toothbrush head is an extension of the handle and is contoured to position the bristles. Bristles are typically round nylon filaments. The degree of hardness is determined by the diameter and the length of the bristles. Larger diameter bristles are stiffer and do not extend as easily into hard to reach areas. The shape of the end of the bristle has evolved over many years. The tapering of the bristle allows greater flexibility and slenderness to reach deep into the sulcus. A recently introduced bristle has a feathered tip, providing up to 70% more surface contact with the tooth. Positioning of the bristles is also important. Positioning tufts10 -20 degrees away from the vertical axis increases interproximal penetration. A dome-shaped head of bristles, where the bristles are raised in the center, has been shown to increase plaque removal. The ideal handle grip should aid in holding the brush at the correct angle so the bristles are present at 45 degrees to the long-axis of the tooth. Is should be long enough to provide adequate grip to give full control, and the distance between the grip area and the head should enable easy access to the most posterior teeth. 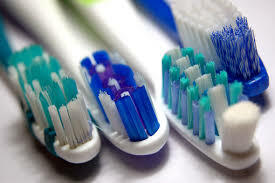 Toothbrushes alone do not lead to adequate plaque removal. There is a clear need for between-the-teeth cleaning. This includes flossing and interproximal brushes. These are available in a wide variety of designs and a high level of customization is available. Take a Look at Under Armour’s Performance Mouthwear. In the past 50 years, a considerable volume of research has concluded that clenching one’s teeth completes a neuro-physiological feedback loop responsible for a complex series of responses resulting in an increase in adrenaline and cortisol production as well as blood pressure and heart rate. That this “stress response” is invariably initiated during instances of physical exertion is undeniably counter-intuitive because of its detrimental effect on athletic performance. Cortisol in particular can, at high levels, cause the body to enter a state of constant muscle breakdown and suppressed immune function, thereby increasing the risk of illness and injury while at the same time reducing muscle. The first research into the application of an oral appliance in athletic performance first began in 1958. Further research has continued over the years. A 2009 study involved an in depth comparison of muscular endurance with and without a mouthpiece and concluded a significant improvement in sporting performance resulting from the use of a specially designed oral appliance. Trial participants showed an increase of 1% in mean bench press repetitions and 17% in preacher curl repetitions when wearing a Bite Tech product. Perhaps more significantly, cortisol levels were found to be on average 49% lower. Under Armour Performance Mouthwear (UAPM) Products are engineered using Bite Tech’s patented technology and clinical trials have shown that there is a definite improvement in the response to auditory clues and a potential improvement in response to visual clues when these products are used. The UAPM Products use ArmourBite Technology that is backed up by 15 years of research. It positions a patented, uniquely shaped Power Wedge between the molars to help maintain optimal spacing and reduce the effects of clenching by reducing cortisol production as well as reducing lactic acid build-up by up to 25%. Over 1,000 professional athletes wear Armour Bite; the appliance is a powerful tool in the quest to enhance athletic protection and performance. UAPM has been engineered to unlock the body’s true potential and has a positive impact on an athlete’s ability to train harder and perform at a higher level by increasing strength and endurance and reducing the impact of the stress response that omits physical performance.